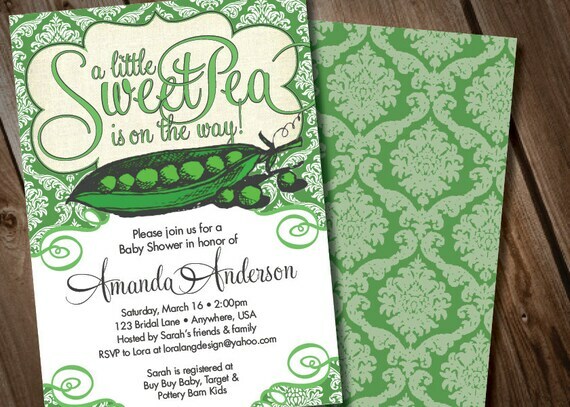 Perfect for a "Little Sweet Pea" themed baby shower, this card is double-sided, comes in gender neutral colors and is so whimsical and fun! After purchasing, this featured design can be customized with your provided information. I than e-mail the purchased file to you so that you can choose to have them printed any way you'd like! Most things on the card can be customized including fonts, colors and wording. This listing is for a high resolution digital file of the pictured invitation in PDF format (300 dpi). Final digital file is provided as two invitations per 8.5 x 11 sheet. Other party printables are sold separately. These invites are designed to be printed at your local print/copy shop, any online printer or on your home printer. Default invite size is 5x7. You can also request this to be a 4x6 size. Buyer is welcome to print the file as many times as you want. The design is for personal use only. Commercial use, file sharing, or reselling the design is not allowed.